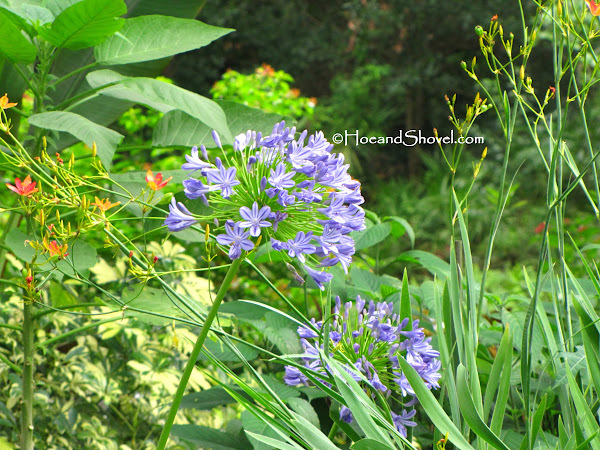 It's a good thing there are some summer bloomers that don't mind humid, hot conditions. The July garden offers just that. Day in and day out. We start out warm and we end up warm. 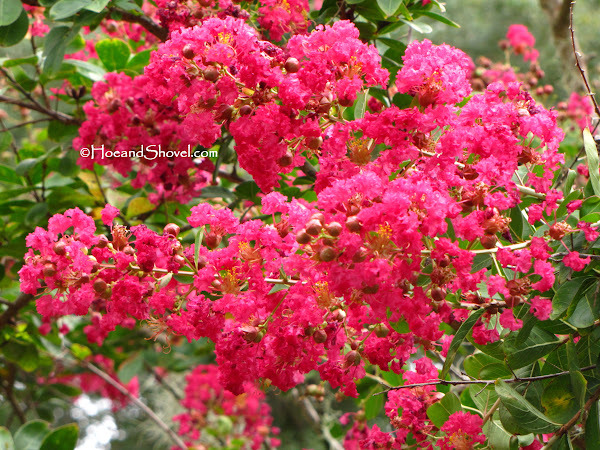 Crape myrtles come alive at the onset of summer and thrive in our humid conditions. 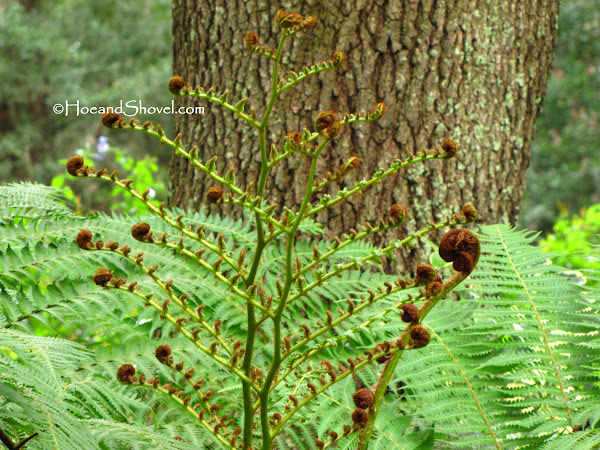 Florida's rainy season begins in summer following our long, dry spring. We are grateful for the six plus inches of rain that started the rainy season off with much needed heavenly liquid. 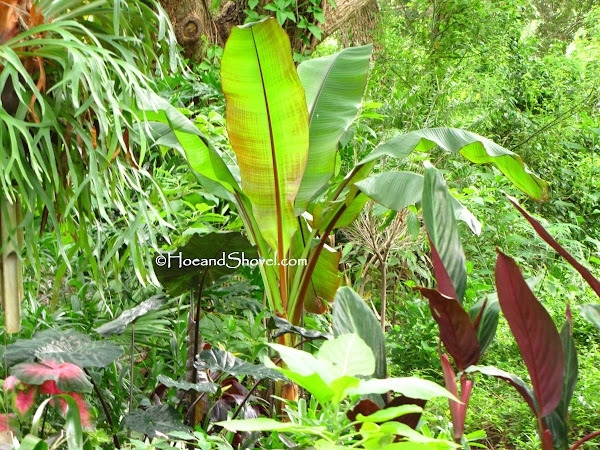 As a result of our consistent warmth and rainy conditions the garden grows like a jungle. Frequent walks through the garden to pick up fallen branches/sticks, pull weeds, soft prune and to pick off dead flowers is beneficial. Getting out very early (or late, or both) and staying in the shade through the middle part of the day is advised in this kind of heat. 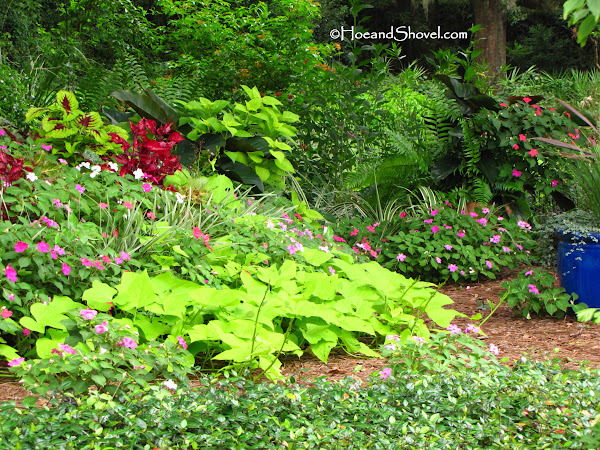 Weeds grow as fast as the plants and can get out of control quickly if ignored. It's the season that reveals the plants we've sited correctly (or not) for size, sunlight needs, and water requirements. 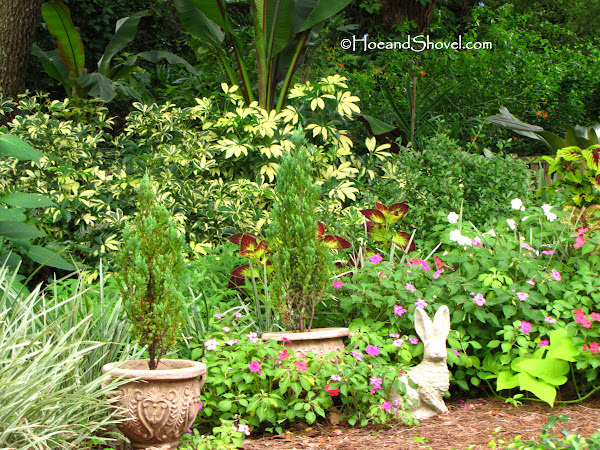 Putting the right plants in the right place is essential for summer happiness. 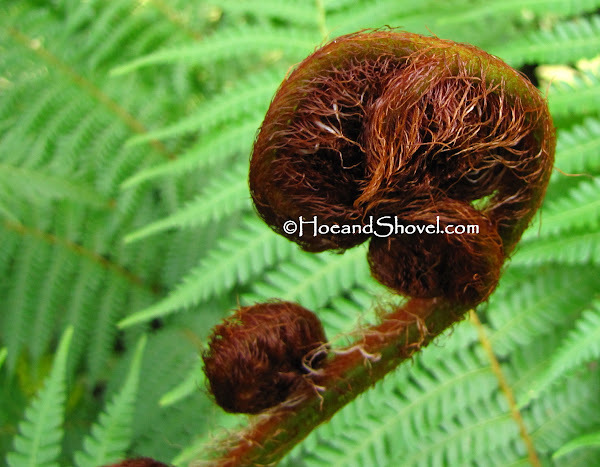 It is easy to see which plants are quite content as they continue unfurling new growth. 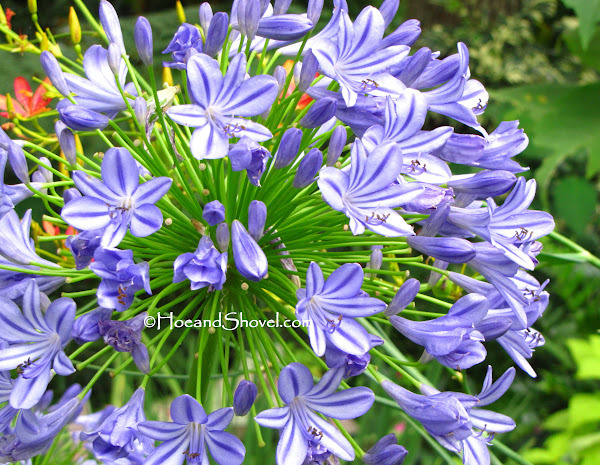 There are a few Agapanthus blooms that first appeared in May still scattered about in the midst of July. Their numerous trumpeted flowers shaped into large round orbs atop tall scapes are providers of nectar to all sorts of flying critters. In the front garden where spring's new plantings replaced the last bit of the lawn there it's easy to see how rapidly they are filling in with all the rain. 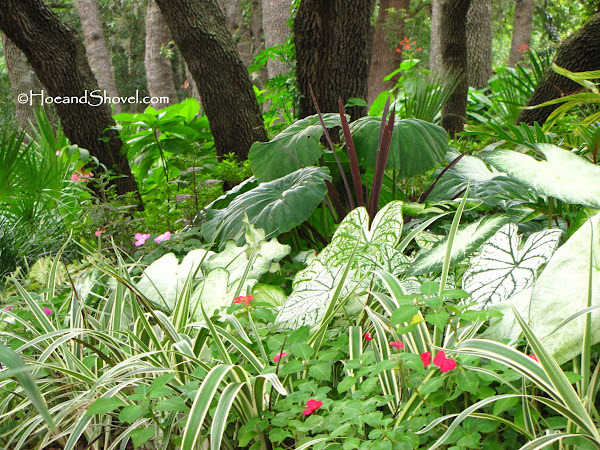 Caladiums have popped out of the ground so happy to be a part of the summer scenery. Some return each year. New ones planted to fill in the gaps go in the ground June/July every year also. There are pests that thrive on summer's feast of overgrowth and hide in its lushness. 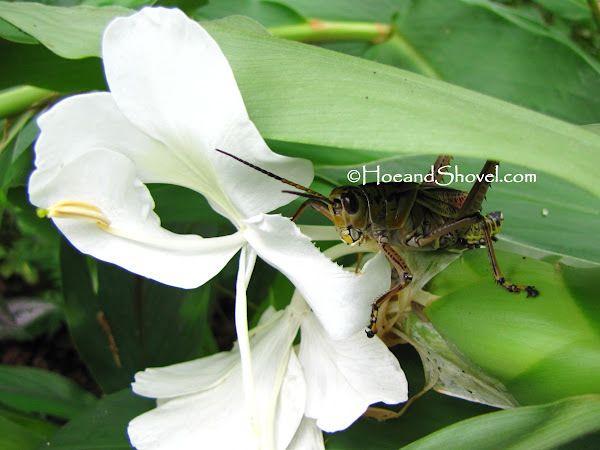 The Eastern Lubber grasshoppers are my biggest problem in the summer garden. Without a predator (except me) to ward them off they eat huge portions of my big-leaved tropicals leaving them tattered and unsightly. This one unpolitely chomping on the sweetly scented blooms of butterfly gingers. 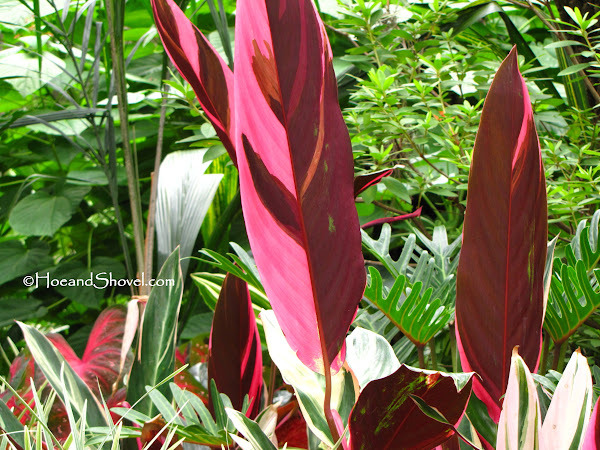 Colorful foliage of Stromanthe in the shade resembles a water color painting from the back side of their lovely leaves. Over in the sunny edible garden weeds have gone awry and need to be tamed. Soon. But the flowering perennials and annuals loving summer's heat draw the hummers and pollinators regardless of the overgrown weeds. 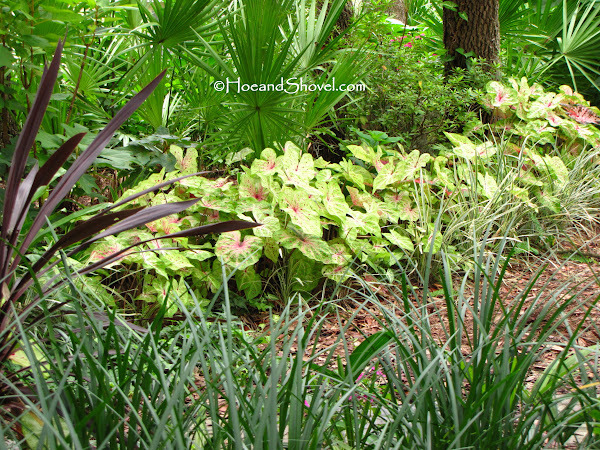 Gardening in the summertime in Florida can be challenging. It's when I am MOST grateful for my mostly shady garden that protects me (and the plants)from the direct sunlight as I work. Like every other season the garden is where you'll find me in my free time. And like every other season the summer garden has its glories. I want to be right there in the face of them so I don't miss a thing. **All photos taken Sunday during a stroll around Hoe and Shovel. For photo identification click on the photo. 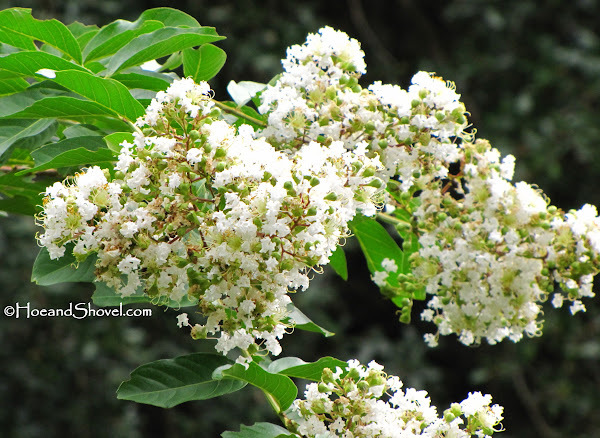 You'll be taken to my Picasa Web Album where each photo is captioned. Back click to return to this post. We enjoyed a serious thunderstorm last evening....I am thankful and so are the plants. 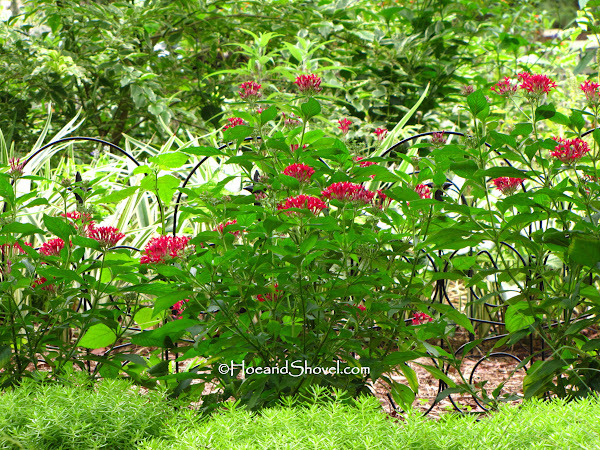 Your gardens are always inspiring as are your thoughts. So Beautiful and so different from the plants we have here. 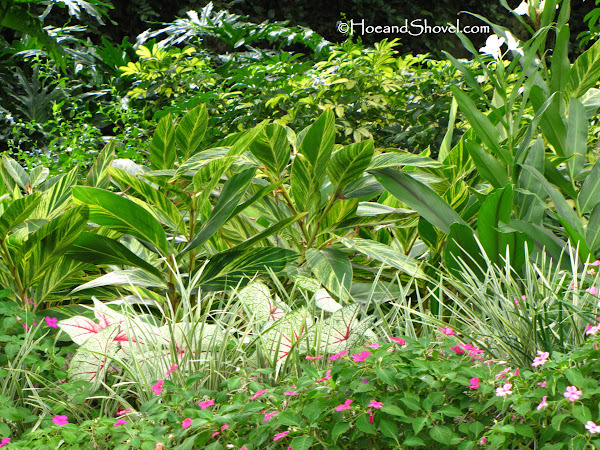 While I don't envy your humidity, I certainly envy the environment it gives you for your wonderfully lush gardens! Meems ~ Your gardens are definitely lovely any time of the year. We've had lots of rain too so that our place is looking more jungle like. We are also thankful for all the rain we've had. Your garden looks lovely, as always. Thanks for inviting us on a stroll. I feel cooler already! Fantastic. It's always a pleasure to stroll with you in your lovely garden. We are having a bit cooler dry season than normal here in Australia. 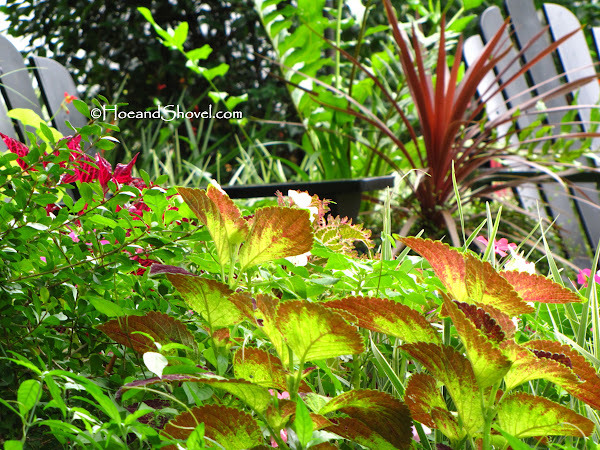 It is nice to see your lush summer garden without having to endure the heat and humidity. Our turn is coming next! Thank goodness the rainy season started. The plants are lovin' it I always love it when you take us for a stroll through your garden. Have you seen any any white peacock butterflies? Last summer was the first time I saw them. I took a pic and asked Rick Brown to identify it. We have more this year. Also am seeing more Swallowtails this year. This time of year when the rains begin to be reliable it is hard to remember the bareness of winter isn't it? 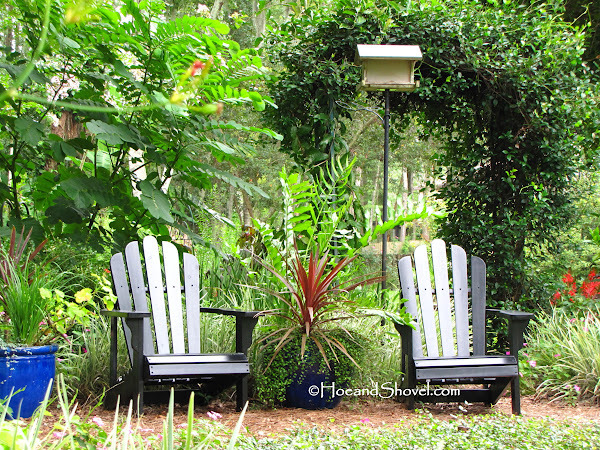 Your garden is overflowing. The stromanthe photo really does look like a watercolor. So pretty. My poor stromanthe which I divided last fall has struggled to grow back from winter. Hopefully it will come back and be strong enough to make it through this winter. I think that last photo is my favorite view with those graceful tree trunks and the gingers and clero between and behind. 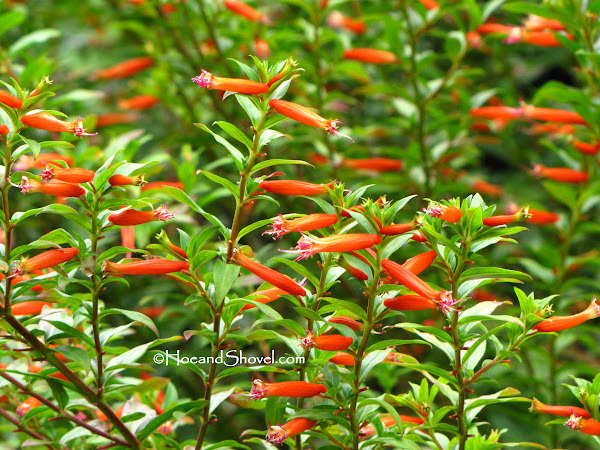 It is amazing how quickly plants grow when it gets hot and the "blessed" rains arrive. 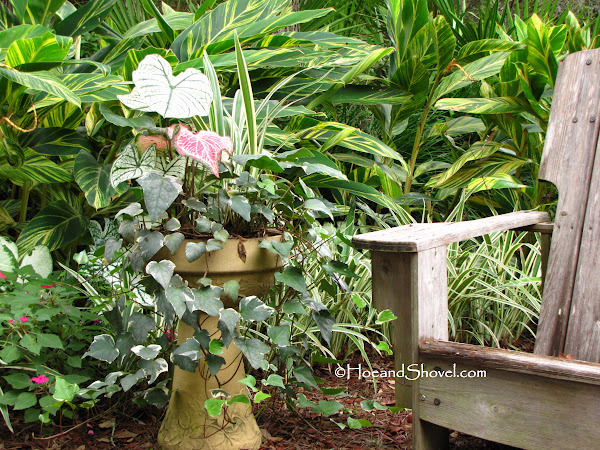 It's a good thing there are so many plants that love our heat and humidity. The plants are lovin' the rain -- how quickly we forget that weeds are plants, too. Darn it! Thank you all for your lovely responses. It is always a pleasure to have each one of you visit my gardens. After all the rain last week the scattered rains have missed us everyday since Saturday. Two days in a row I drove through rain 1 mile from my house by we didn't get any of the lovely drops. So goes the strange Florida rainy season. In this heat it doesn't take long for the container gardens to dry out. The irrigation system is OFF though and most of the garden survives on rainfall alone for the summer.